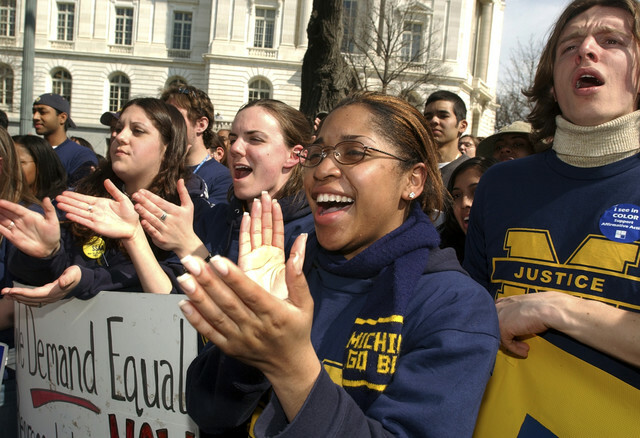 Will the last student of color at the University of Michigan please turn out the lights? Thanks! It’s the weirdest things that jog your memory sometimes. For example, the latest pronouncement from the Supreme Court regarding the use of race as a criteria for collegiate admissions made me think of a lawsuit filed by two Howard University students against Alpha Kappa Alpha Sorority, Inc. The students, Lauren Cofield and Laurin Compton, sued the Howard Chapter of AKA because they were denied admission to the sorority despite the fact that both of their mothers were members, thus making them legacies of the chapter. I asked my Significant Other, a member of Alpha Phi Alpha, if being a legacy meant that you automatically got into a fraternity or sorority. He said that while it gets you noticed, it’s not a guarantee. The suit was filed in 2013 and according to the last story I read on it, a piece in the Huffington Post, the students’ mothers (and co-plaintiffs in the lawsuit), Lessie Cofield and Sandra Compton, had their privileges within AKA, the sorority in which they are members, suspended. With allegations of witness tampering and other things, according to the Huffington Post story, this suit could get really, really ugly before it’s done. But then again, anytime that privilege, be it the privilege of entering a sorority or the privilege of entering a university, gets threatened, those who enjoy that privilege, or think they should, tend to go for the mattresses. I bring this up because I believe that this Supreme Court decision does what Supreme Court decisions do best these days when it comes to racial issues: take what is seen by some to be a “privilege” due to race away while keeping a true “privilege”, like for example legacy admissions, intact. Or, put another way, it balances so-called “fairness” in collegiate admissions on the backs of potential students of color. In case you missed it, the Supreme Court decided by a vote of 6-2 (with Justice Elena Kagan abstaining) to allow the State of Michigan’s constitutional amendment making it illegal to consider race in college admissions to stand. One of the consequences of the amendment is that the percentage of minorities on public university campuses, such as the University of Michigan and Michigan State, has dropped by 25 percent. And let’s face it, that’s kind of what rulings like this do. The folks that make decisions like this don’t take into consideration the fact that people of color and women are basically competing on an uneven playing field. It’s like playing a baseball game in which the opposing team gets spotted 10 runs in the first inning and you have to catch up somehow knowing that you’re always going to be 10 runs behind. Even if you had a team made up of Major League sluggers of color like Ryan Howard, Albert Pujols, Hideki Matsui and David Ortiz, you’re still not gonna catch up unless the disparity is recognized. Which brings me back to legacy admissions. Former President George W. Bush is never gonna be confused with Albert Einstein, but he got into both Harvard and Yale. How? Because his father, former President George H.W. Bush is an alum of both schools. Thus, he’s a legacy. Thus he got the privilege of admission that includes. Basically, he was born on third and thought he hit a triple, something that the students most impacted by the decision that pissed Justice Sotomayor off so bad she killed 58 pages worth of trees can’t say. And that’s unfair…even if the conservatives cheering this decision want you to think otherwise. Let’s remove all preferences. Let’s make it so everyone, and I do mean everyone, who applies for college admission has to do so knowing that their merit and their merit alone will be the only criteria judged. No more Affirmative Action? Fine. But let’s have no more Legacy preferences either. You’re a bright kid. You don’t need those extra points you get from Mummy or Daddy’s degree from the school of your choice, right? I know this is wishful thinking on my part because the folks who champion “merit-based” everything know that if it were applied to them, things would get ugly. Maybe for them to understand how wrong they are, and how much of an advantage they’ve enjoyed without realizing it, it needs to.